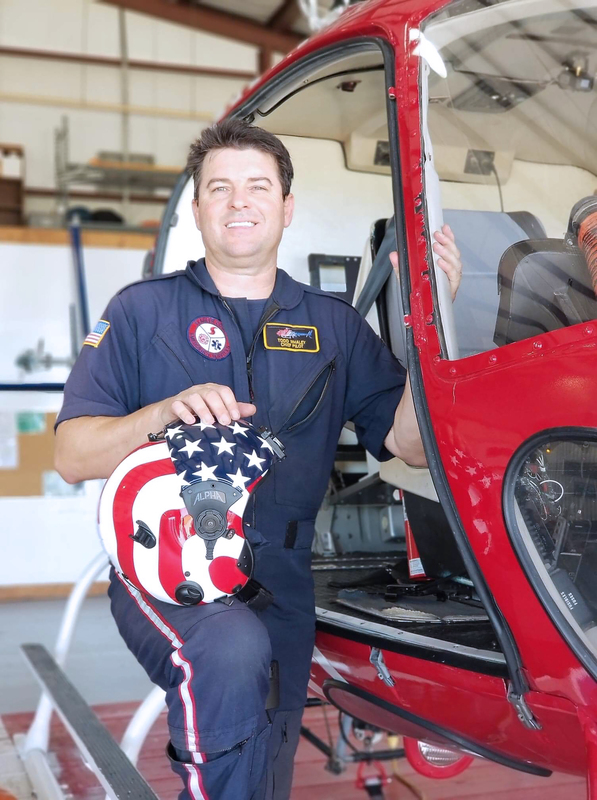 Advanced technology, personalized care restore helicopter pilot’s smile. Former U.S. Navy air crewman Todd Whaley spends his workdays in the Florida skies, running medevac missions and fighting wildland fires as a helicopter pilot for Flagler County. For the longest time he ran those missions while fighting a four-alarm battle of his own. It’s a battle that started 32 years ago when Todd, then 14, tried driving a three-wheel ATV vehicle up a steep hill in North Carolina. When the hill proved too steep for the climb, the ATV fell back on top of Todd, hitting him in the mouth and breaking several teeth. “I’ve been through hell with this mouth ever since,” Todd relates. 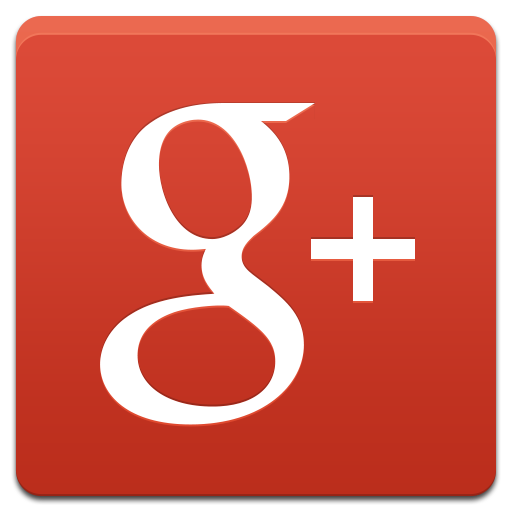 “I wound up needing to have about seven or eight root canals done as a result of that one ATV accident alone. Then, after I got into the Navy, I knocked one of my front teeth loose again. The loose teeth in the back were in part a result of gum disease, which Todd was treated for in 2001. About 15 years later, another tooth near the front became loose. Todd was never pleased with the dentist he chose to correct that problem. “From the very start they were saying they wanted to refer me to a specialist, and so I never had a good feeling about them,” Todd says. “I remember sitting in their waiting room one day, feeling very unsure about them, and seeing this newspaper on the table. The dentist Todd read about was Rajiv Patel, BDS, a board-certified implantologist who 30 years ago founded DeLand Implant Dentistry with a vow to deliver advanced, personalized and comprehensive care in a comfortable, relaxed and friendly atmosphere. Upon first examining Todd, Dr. Patel realized immediately why his competitor was leaning toward sending Todd to a specialist for his dental care. The amount of gum disease and damage the doctor discovered was severe. “Todd came in with what we call terminal dentition, which means the condition of his teeth is hopeless,” Dr. Patel educates. “He had severe periodontal disease. Many of his teeth that showed extensive signs of decay, were either breaking, broken or had cavities. Todd wasn’t surprised to hear Dr. Patel’s evaluation. It was consistent with what he’d heard from the other dentist he visited, except that Dr. Patel went a step further and explained how the existing issues had the potential to cause more problems later. Todd agreed with Dr. Patel’s course of action, but his immediate concern was the loose tooth near the front of his mouth. The fact he was heading out of town two days later for a continuing education course made that issue a priority. “I explained to him that I was leaving town, and so after we did the impressions for the new teeth, Dr. Patel made me a temporary device that filled the gap that was left when he pulled the loose tooth,” Todd explains. Todd and Dr. Patel met again a couple weeks later to firm up their restoration plan, which began with Dr. Patel removing all of Todd’s natural teeth, treating his gum disease and performing a bone graft on his jaw bones that would allow them to support implants. It takes up to six months for the mouth to heal and the grafting process to be completed. During that time, Todd wore a temporary denture on both his upper and lower jaw. Once his jawbone had healed properly, Todd was fit for implants. 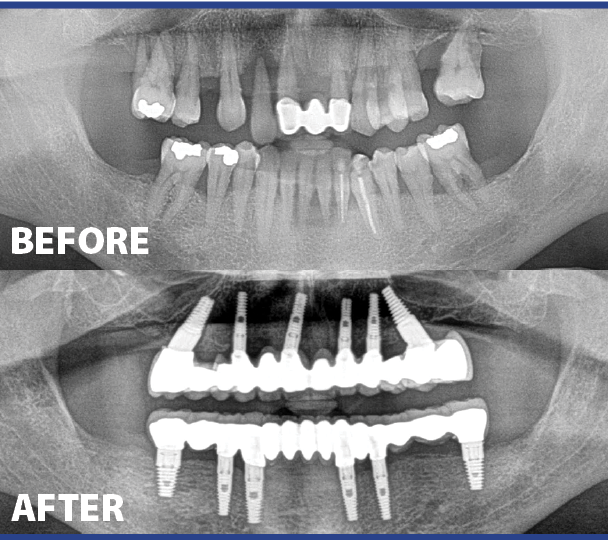 During one visit, Dr. Patel placed six implants each in Todd’s upper and lower jaw. After waiting another four months for the implants to fuse, Dr. Patel fit Todd for his fixed upper crown/bridges. A month later, he fit him for the fixed lower crown/bridges. “Todd’s case actually lasted about two years,” Dr. Patel reports. 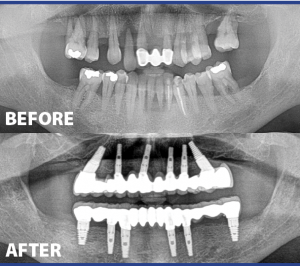 “But the advantage of going with the implant-supported fixed dentures is that the implants will transform the forces of the jawbone and actually help maintain the jawbone for a longer period of time. After years of fighting virtually every conceivable battle with his teeth and gums, Todd says his mouth has never looked and felt as good as it does now and that never before has he smiled with the confidence he does now.